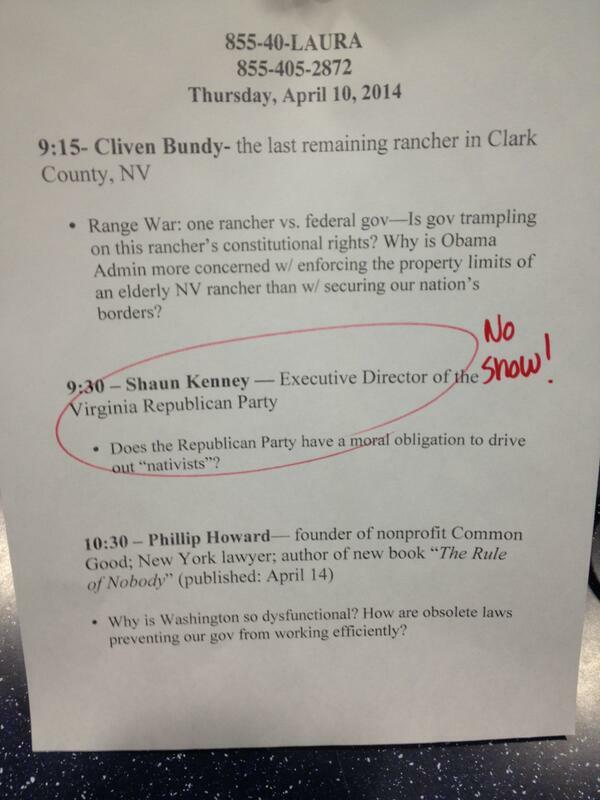 Virginia Republican Party executive director Shaun Kenney was a “no show” to conservative host Laura Ingraham’s radio program Thursday. Ingraham was prepared to question Kenney about his statements that conservatives who oppose amnesty are afraid of “The Other” and that “nativists” should be driven out of the Republican party. Kenney made the statements in an office meeting that included former SEIU secretary-treasurer Eliseo Medina, according to video footage published Tuesday by The Daily Caller, and on his personal blog. “And I think that we understand too that there’s a lot of people that are afraid, of you. Not for any reason that they ought to be but because you’re just not somebody, you’re just not people that they’ve ever had an opportunity to sit down and encounter, to talk to… A lot of people concern themselves with the Other, and it’s not a comfortable thing to have dialogue, and it’s not a comfortable thing to have that encounter with the Other,” Kenney said on the issue of immigration reform, according to the video. Kenney also added that neither party should support immigration reform simply for “vote-harvesting” purposes, though SEIU official Eliseo Medina, present at the meeting with Kenney, previously pitched immigration reform in a speech by stating that it would help Democratic chances.